Okay, to tie this in with the theme of the blog, PowerPoint, this occurred while traveling to review presentation content with my client. I recently stayed in downtown Toronto which along with fantastic restaurants (I HIGHLY recommend the ribs at Baton Rouge) it has the SkyDome ball field. Over the course of three nights I enjoyed baseball games – without leaving my room. Click here to view a quick movie that explains all. I am setting up a new Dell laptop and making sure I like its performance before purchasing a number of them for shows. Well I just ‘discovered’ one of the worst (ie. stupidest) factory settings/features. Turns out that Dell has a power save feature, set as the default, that disables the network port (NIC). Worse, it does not notify you of it being disabled – it’s just not there! Needless to say I discovered this gem while I was without a power supply and needed to connect the internet. Add one more to my list of factory settings to change. International flights are great. Larger planes and more amenities. 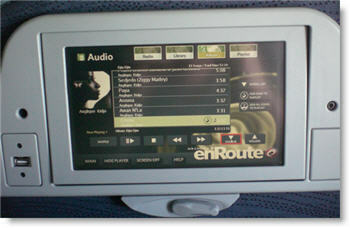 Earlier this week I took this photo of the multimedia player that was on the seatbacks. I was able to select from a large library of music, or could have watched one of the 30 movies. Still a long time to sit on an airplane, but tech novelties make it a bit more enjoyable. 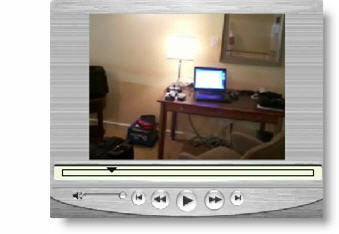 Also, note the USB port on the left. Yesterday Microsoft released the largest Office Service Pack ever (SP3). It covers security, improvements, Vista compatability and interoperability with Ofifce 2007. • Over 70% focused on security. • Includes 600+ new hotfixes (including fixes to Watson crashes). • Includes 50 public updates/security bulletins. • Includes SP1 and SP2. • Total of 77 languages and 398 distinct patches. Easiest way to download is from Microsoft Office Update. As mentioned, I have been entrenched in two large projects that are being developed in PowerPoint 2007. There are tons of great features in the version – and there are tons of old-and-new annoyances, bugs, etc. I could either fumble through many of the new features, or I could use some of the great resources that are available to all. 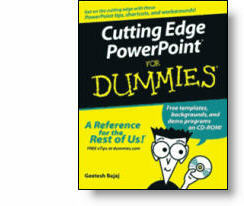 Over the past few weeks I have referred to “Cutting Edge PowerPoint 2007” from the “For Dummies” series many times. This great book is written by fellow PowerPoint MVP Geetesh Bajaj. Not really advocating this book over any other, but I am saying everyone – myself included – has some great resources available. Over the past few days I have been testing a beta version of the next NXPowerlite. Tommy over at Neuxpower Solutions contacted me at a perfect time, as I have been working exclusively in PPT 2007 for two large projects and have plenty of test subjects. File 1: lots of large images and several charts created within Powerpoint. Original 20.8MB, after compression (at the ‘excellent’ level) 12MB. File 2: LOTS of large images. Original 146MB, after compression 44MB! When I hear the new product is available I will let you know. In the mean time, you can get the details about NXPowerlite here. What is it; Macromedia or Adobe Flash? Mergers and acquisitions even effect the most seemly stable companies. So the question came up that a client could not find the Macromedia Flash Player, would the Adobe Flash Player work? Both are the same thing. The Flash format was developed by Macromedia, hence – Macromedia Flash (player). Recently Macromedia was purchased by Adobe and now the Macromedia Flash products have been rebranded Adobe Flash. Received an email from PowerPoint MVP, Tohlz (Shawn)of PPTHeaven about a PowerPoint Animation Contest held by Korea’s PowerPoint Expert Club. Shawn has posted the 1st and 2nd place presentations on his site. These are worth the effort to download and look at – lots of great animation effects! Click here to download and view the winning entry by Coolguy7. Click here to download and view the 2nd place entry by Zzagdol. Okay, the time has finally arrived. I am doing a major project in PowerPoint 2007! It is not that I have a problem with PPT 2007, I just have not had a client request. So up until now I have actually used PPT 2007 more when it was in Beta that after its release. Well, like many I am finding it somewhat tedious to learn where everything is in the new interface. I am also working under some tight timelines, so I do not have the luxury of learning at a leisurely pace. So for me a short term solution has been to add back some of the familiar PPT 2003 tool buttons. 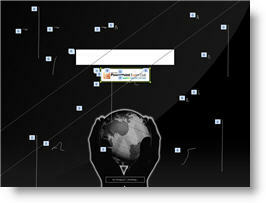 This is a limited interface – it does not give you all of your customized layout from PPT 2003 (I wish! ), but it does give a familiar look and feel to things. This is a free add-in that can be downloaded from here.